The environment we work to build everyday for our youth mirrors our organizational culture. Our approach to work and life is the same: enabling individuals to build self-learning pathways to find purpose and lead meaningful lives. 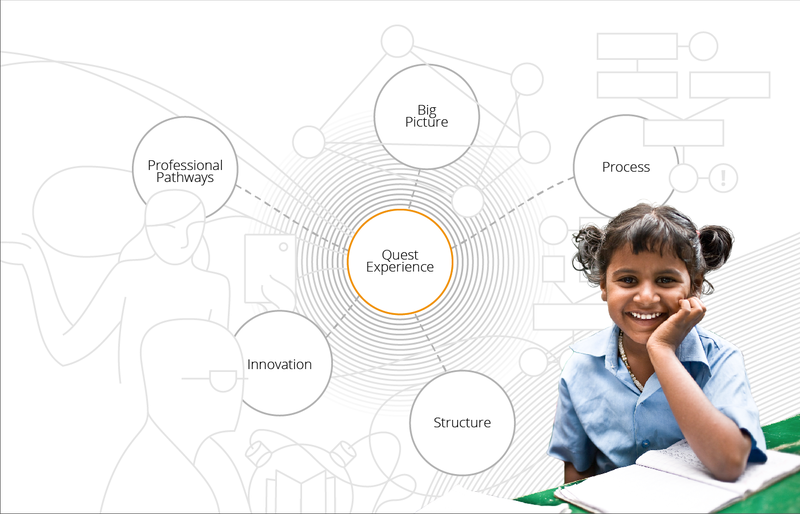 Continuous learning is at the heart of Quest's culture. We measure success by the growth of each individual who works with us. Built into this growth are the constants of self-evaluation and accountability of a determined striving towards our goals. 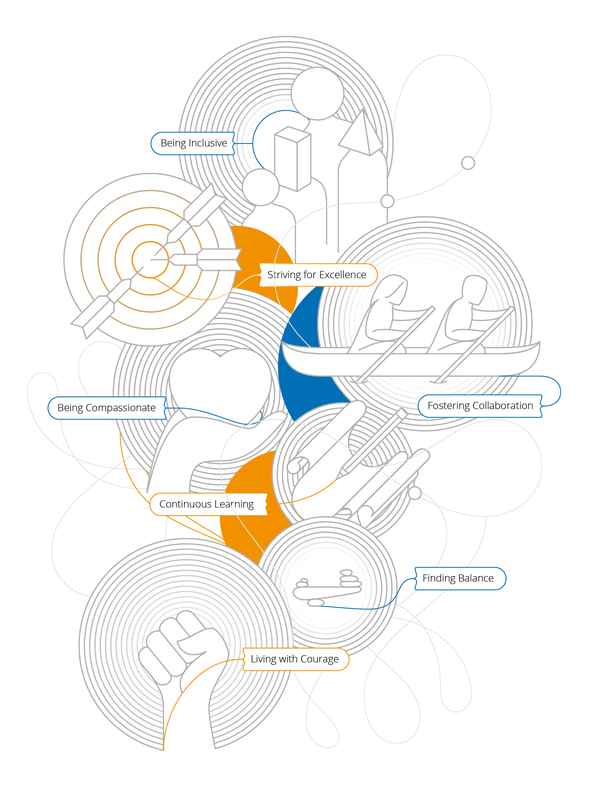 Striving for excellence while finding balance; compassion and inclusivity in an environment that is accessible and friendly; fostering collaboration, always willing to connect and discover together: this is the Quest way. Setting goals at Quest is a participatory process. They result from lessons learned and how we incorporate them in our work through reflection. The goals for the organization begin with discussing external trends, our strengths and the areas of improvement to make informed choices and ensure our relevance internally and externally. This in turn is only made possible by striving to understand ourselves and how we fit into the greater plan. Our approach involves developing the capability to create, curate and share strategies and materials for self-learning experiences. Constantly evolving, we work in a fun and engaging manner to build a sense of ownership, ensuring knowledge is shared and preserved, efficiently and with accountability. Ours is a structure centered on growth. We strive to understand the larger ecology and adapt to the changing environment. Open and flexible, we are structured to assimilate different strengths, energies and approaches to solve different needs. We do this so that we can support each other and find opportunities for collaboration and creativity, delivered in a focused and efficient manner. At Quest, innovation is critical for inspiration in the way we build on existing solutions and create new ones. We constantly ask ourselves: has the need been articulated or tested for positive impact? Has it created efficiency? Does it map to our Theory of Change? For us, innovation is the relationship of independence and interdependence, creating a strong community that relies on living the experience, feeding back through reflection, and forming a library of vital resources to generate new insights and new ways of doing. We realized early on that people want to be coached and supported, not evaluated and assessed, so to develop and realize our full potential as individuals and as an organization, we began to build professional pathways to enable leadership. We ensure continuous and sustained learning, helping each member of our team gain skills outside their primary skill set. We strive for holistic growth through personal and professional development. We achieve this through a layered structure of Learning Days, conferences, workshops, appraisals, and feedback as well as training and personal growth plans. At Quest, we practice diversity in every form. Collectively, our team hails from 12 states and speaks 15 languages. It consists of talented, dedicated people who are proud to make a difference by doing work they love. Just as they contribute to the bigger picture, every individual at Quest is on their own journey, a progression that involves developing the self, facilitating learning, making pathways, and sharing stories. In 2016, our team grew even further with 27 new staff hires, of which 20 were women. And with a total of 85 employees, we’re still hiring! For a team of young people who come from all parts of the country, food is a great way for us to connect and further that camaraderie. Click here to meet our diverse team here at Quest! Built into our office is an open learning space where we gather for discussions, debates and brainstorm ideas. Called ChiliPili Loka, this space is where many of our innovative plans are created and launched. It is also a place where we host our daily lunch and team meetings. To us, it signifies an open space for dialogue and collaboration. We have also created our very own anthem to keep us going every day and remind us of our larger purpose - Run and Get It Done!